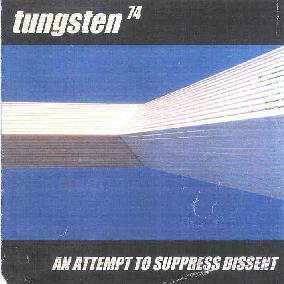 Tungsten 74 - "An Attempt To Suppress Dissent"
From New York, Tungsten 74 play a metallic brand of psychedelia and spacerock. There's little band info but they seem to be a guitar, bass, and drums trio, though there are some cool space synths that crop up throughout the CD. With the exception of a few voice samples they are completely instrumental. The music isn't flashy, the band's trademark being to settle into a single thematic groove that they throw themselves into. Among the standout tracks is "Strong Koln", an interesting blend of metal and psychedelia. The bass and drums lay down a basic rock beat, maybe even a bit New Wav-ish. But the guitar has a crossover sound that is somewhat metallic... yet it's got a strong trippy quality as it cranks out non-flashy licks accompanied by a wailing space drone. "I Was Class President" and "I Was Class President Too" are two of the more spacerock oriented tracks. The former features meltdown guitar accompanied by a fuzzy drone and Star Wars attack space synths. The later is similar but is more of a synth and guitar freakout. Total space!! "End Credits" and "No One Knows For Sure" spotlight the more melodic side of Tungsten 74. "End Credits" has a very simple, but really gorgeous guitar melody, and the wailing guitar is backed by a marching rhythm section. "No One Knows For Sure" includes more simple guitar melodies that carry the tune effectively. Two of the album's 14 tracks break the 5-minute mark. "Throw That In The Trash, Son, This Ain't New York City" is similar to "Strong Koln". Tungsten clearly love to jam and their brand of heavy pulsing rockin' psych-metal trips along nicely, though the music develops very little given its 8-minute length. I love the end though, which builds up to frenzied freakout levels, the bass never letting up even while the guitar and drums reach their peak and head into a bubbly cosmic descent. "Homecoming" is a melodic, heavily fuzzed psych tune with a nice mixture of edgy noise and floating atmospherics. Simultaneously brain-piercing and relaxing. But like "Throw That In The Trash Son", it's a strong idea that's screaming out for further development. In summary, Tungsten 74 is a bit raw and I would have liked to hear the songs evolve a bit more. For this reason it's probably best that most of the tracks are only a few minutes, though there are great possibilities for these guys to create awesome extended jams. So I dig Tungsten 74's sound and hope to hear more from them because they've got the basis for being a solid instrumental heavy psych band, or metal band with psychedelic influences, or spacerock band with metal influences... lots of possibilities here.